The balance between basic rights and democratic principles on the one hand, and security on the other has been a central question of our political imaginary for a long time – even more since 9/11 and the expansion of the war on terror as the main counter-terrorism response. The political sphere, the media as well as the scientific literature have addressed this issue. Scholars have mainly focused on the impact of emergency measures implemented in the name of security on democratic regimes. While often seen as a particularly contemporary issue, this debate is not really new. As Sharon Weinblum reminds us, authors such as Locke and Rousseau already considered the possibility for a regime to bypass its basic laws in times of danger or crisis. Today, our contemporary reasoning still holds this idea that, when endangered, a democracy should be able to subvert basic rights and democratic principles to ensure the survival of the citizens as well as its own. Following critical security studies, Weinblum discards the classical opposition between security and democracy and invites us to understand these two concepts as social constructions. She argues that such an opposition narrows the scope of the two notions and can be used to justify current restrictions of democratic principles in the name of counter-terrorism. According to her, we shouldn’t conceive of security and democracy as fixed realities but rather as the products of a discursive competition. In this book, drawn from her PhD thesis, Weinblum explores the competition of narratives – defined as “spoken exchanges knitting phenomena into a plot with a beginning, middle and end” (p.18) – developed in the Israeli parliament, the Knesset, during the debates around the adoption of new or revised security measures during and after the second intifada. She identifies two competing narratives, namely a dominant narrative constructed around the notion of defensive democracy – where democracy is framed as a regime guaranteeing the existence of the nation-state of the Jewish people – and a counter-narrative, more marginal, based on the respect of basic rights and democratic principles. The two narratives offer different understandings of what security and democracy mean and compete to shape the debate. A constructivist approach that is directly inspired by the Copenhagen School is developed in the first chapter of the book. It briefly presents the theoretical background of the research, and particularly demonstrates how the securitization approach can be useful to deconstruct the classical security-democracy opposition. The author completes this approach in at least two ways. First, she tackles the usual criticism of securitization theory’s tendency to focus solely on the authorized speakers and dominant discourses. Studying the debates held in the Knesset, composed on a very proportional basis, Weinblum also considers more marginal voices that otherwise could have been ignored – to the point of constructing a counter-narrative based on the discourse of a single representative. Second, she also addresses the ambiguous relations between speech acts and context by acknowledging the importance of an existing discursive structure enabling and constraining the various possible discourses. Chapter 2 describes the larger discursive context in Israel – constraining the different possible narratives – as well as the main actors able to address security issues. One of the book’s great assets is its unique understanding of the security context in Israel. Given the state’s peculiar relation to security matters, this detailed analysis is highly valuable. Indeed, in the Israeli social imagination, the Jewish state is constructed as a vulnerable actor that has no choice but to defend itself against permanent enemies. However, the downfall of such a specific case-study might be found in the difficulty of drawing any general conclusion from this research. Still, as Weinblum herself argues, it is a relevant case to explore the broader relations between security and democracy because it sheds light onto a democratic state discussing measures similar to those adopted by other contemporary democracies in the name of counter-terrorism. The next three chapters present the results of Weinblum’s research. They cover the debates in the Knesset about different laws arranged into three large debates, namely the relation between security and freedom of speech, the notion of enemy and its articulation with the democratic regime and finally, the link between terrorism and the right for Palestinians to reside in Israel. For each theme, several laws are analyzed and each time two to four different narratives are exposed, showing how members of the Knesset understand and defend or criticize these laws. Each debate highlights two competing coalitions of narratives: on the one hand, the dominant narrative of defensive democracy supporting the laws necessary to face the (permanent) existential threat Israel and its democracy are facing; and on the other, counter-narratives arguing the laws themselves constitute a threat to democracy as they restrict basic rights and democratic principles. The author thus substantiates her theoretical claims: democracy and security are not immutable realities but are instead social constructs that can be subject to contestation and criticism. However, while very informative of the different narratives’ content – particularly the defensive democracy narrative – the research leaves aside the potential processes of co-construction. If Weinblum strives to draw attention to marginal voices, the book overlooks their role in the construction of the dominant security narrative in Israel. Counter-narratives are reduced to a form of contestation and criticism responding to but never actually challenging the dominant narrative. Because discourses have direct implications on actors and their environment, the last chapter discusses how the defensive democracy narrative has impacted the democratic regime in Israel. It shows how democracy is restricted to a vulnerable regime whose main raison d’être is the survival of the Jewish state and its citizens. Here, as laws get passed, democracy is transformed into a regime that protects the majority by restricting the rights of a disloyal and threatening minority. Hence, restricting rights becomes part of normal politics and is integrated into the democratic regime. 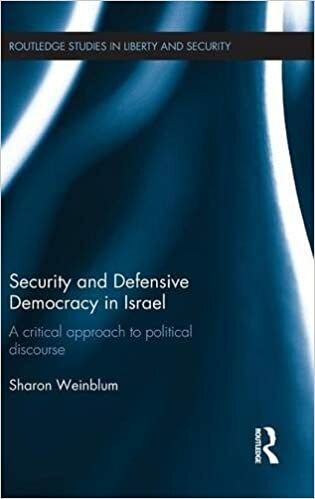 As a direct application of securitization theory to the relationship between democracy and security in Israel, this book will be of much interest to scholars interested in critical security studies. However, Weinblum doesn’t elaborate much on the main concepts and theories in critical security studies and seems to be addressing an already informed audience. The global Israeli security background being well-documented, scholars working on the security policy of Israel itself will also want to read this book to understand Israel’s crucial relationship with security. Finally, the book’s deconstruction of the democracy-security opposition and its exposition of debates around emergency measures will be of interest to scholars working on today’s hot security topic of counter-terrorism.